The standard number of schools for children (not in special education) atteding kindergarten through fourth grade in the Mt. Pleasant, MI school district is one. However, because of various organizational changes that is the fault of no one in particular, my son (from early childhood ed on) has already attended five schools in the district over a five year period and he is only in the third grade! The standard number of schools for Mt. Pleasant area children (not caught in the mix of organizational changes) in special education for K-4 is two. Usually children who are assigned to the mildly impaired class attend one school for K-2 and one school for grades 3-4. Not counting his preschool years (where he attended two different schools), my son will have actually attended three different schools so far for the K-4 years. However, he may be going to a fourth depending on what we decide upon for fourth grade. The Mici class we had in placed in this year is really designed for (K-2), but we've decided to push it for the third grade in order to stabilize his educational career. Please see our timeline below. I added brief explanations and commentary for each year my guy has attended. Has anyone seen a timeline as crazy as this? My guy attended a Early Childhood classroom at Mary McGuire from September to December of that year with a wonderful substitute teacher I'll call "L.M." (The previous teacher for the room, an older woman, injured her back and retired.) As a sub, LM was only allowed to teach for half a year. So myyoung boy moved with his class to Kinney school (now closed) to be taught by Mrs. O, who has degrees in teaching and speech pathology. As a brand new elementary school student, my son attended Ganiard Elementary School. He was placed in Mrs. M's MiCi room and also attended developmental kindergarten with Mrs. Sw. My husband and I were so naive as to what was to come in future years. My guy was moved to another school because the MiCi room was moved to Rosebush Elementary School where Mrs. M. was given a larger room. My son attended kindergarten in Ms. Sh's classroom. The year before, Mrs. M suggested that he repeat kindergarten because my son still needed a lot of help with his fine motor skills. Although that meant my son had to repeat Kindergarten as a seven year old, we agreed that it was probably best for him to go back to Kindergarten. Emotionally, that was a difficult decision because we had to face the fact that our son was indeed delayed in multiple areas. My guy stayed with Mrs. M at Rosebush and attended 1st grade with Mrs. R. I should note that Rosebush is five miles or so north of Mt. Pleasant and that my guy had a long bus ride both of the years he attended that school. At that point I was starting to realize that we were on a very curvy educational path and was glad to have in him the same school two years in a row. Mrs. M was assigned the MoCi rooms, so my guy was sent to Vowles Elementary School to be in Mrs. C's MiCo classroom. Mrs. C had previously been the MOci teacher. He attended 2nd grade with Mrs. L. I was sad to have my son leave Mrs. M's room because she was a wonderful, effective teacher whom my child respected. Although my struggled with Mrs. C in the MiCi room at the end of the year, he delighted in walking to the school (under very watchful eyes) near his home. Reports coming from Mrs. L, the 2nd grade teacher, about our son's behavior in her class were generally good. 2008 IEP note: I, in total mother mode said "no" last March to having my child moved to Pullen Elementary School, the only K-4 elementary in the district my guy has not attended. A move to Pullen would have meant six different schools in six years in the same school district! Mrs. C took, my guy's previous teacher took an MoCi teaching job in Alma. Mrs. T. has replaced her as the MiCi room teacher. She will teach primarily 5-8 year olds (K-2), but will have one very stubborn ten-year-old student with equally stubborn parents as well. The new teacher found out about her new position just last Thursday (August 21), which gives her 1.5 week(s) to settle in. My husband and I met her yesterday. She seems nice. 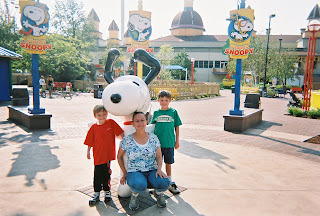 I also found out my son's third grade teacher will be Mrs. N. I happen to know that Mrs. N has experience teaching boys with AS, so I think that placement may be a blessing. He hasn't said anything about all the school switches he has had, but has indicated that he doesn't want to in the MiCi room anymore. We told him what the letters stood for (mildly cognitive impaired) when he asked late last Spring (after his IEP meeting). Since then he has balked at being part of the class. He has been adamant about just being in the third grade for many months now. We made an appointment for yesterday (August 27) with the principal, Mr. H. just to communicate that our son (who is quite headstrong) is having difficulty with the idea of being in the Mici room. We vowed to continue our communication and support with the Vowles elementary staff. I indicated that as a stay- at-home mom that I'd be happy to help anyway I could. Mr. H said it was the goal to include our son in the third grade as much as possible and then he introduced us to the brand new Mici teacher. The principal then left and my husband and I quickly briefed her on the situation and agreed that I'd meet with her once school starts to see how things are going. Note: My son has made great progress during the years he has attended school in this district. I am not angry about all the changes, but I am bewildered and thus ready to be proactive about stabilizing the remainder of my son's school years. I am hoping to post about our future timeline next. 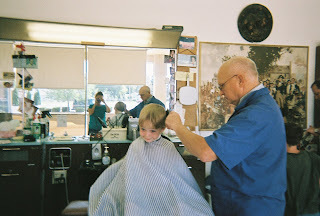 Hair cuts used to be hard until Grandpa started giving his eldest grandson "fireman haircuts" when my guy was four. 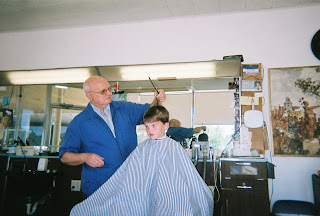 Until the idea of "fire man haircuts" came about, Grandpa needed a few extra hands to gently keep my distraught (squirming and screaming) son still. After the fireman idea appeared to be a hit with my son, hair cuts were much easier. As a four year old, he beamed with pride when grandpa put "fire man lotion" in his hair. Now at ten, my son still gets lotion in his hair, but is too old for "fire man" hair cuts. However, he now loves to go to Grandpa's barber shop where his grandpa has cut hair part-time for more than 30 years. In fact, he often beats his brother (below) to the barber's chair to have his hair cut first. 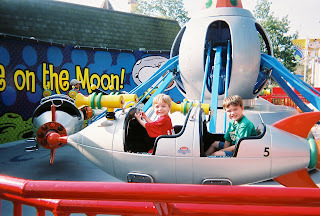 My little one, now five, never had a "fire man hair cut" because he sat still from the beginning. However, like his brother, he does get the lotion and a treat from grandpa's candy bowl that is on hand for all the children who come in. Grandpa's barbershop is a three hour drive from my house, but we don't go anywhere else unless we can help it. Photos taken by Julie Lorenzen at the Anthony Wayne Barbershop. 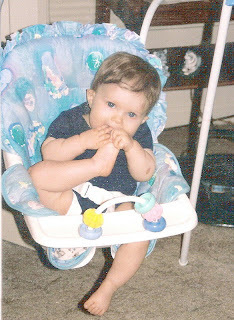 My now, not so little boy was born. I cannot believe we just celebrated his tenth birthday! Time goes so fast. 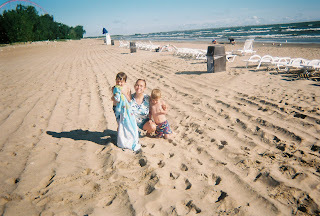 It seems almost like yesterday that I... gave birth to my baby on his due date, August 17, 1998, around 9 p.m. Everything went smoothly from the pregnancy to the birth. Of course I checked my newborn out from head to toe as soon as the nurse placed him in my arms. Right away I noticed the folded over ears that I thought would round out, but never quite did, the birth mark on his left forearm and that crop of dark hair that lightened to a golden brown. All those traits (that can be seen in the photo above) are still there. However, as you can see in that first photo, he is much bigger now. He is growing up so fast. 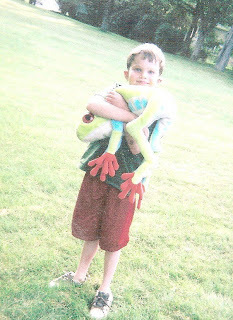 Currently, my guy loves his scooter, looking at our family photos on the computer, and of course, Froggys! !